Barcelona is one of the coolest cities in the World, a beautiful metropolis with rich culture, glorious art and architecture, and locals that welcome you with open arms. Spain has so much to offer tourists when it comes to beaches and sun kissed vacations, but when it comes to city breaks there really is nowhere like Barcelona. If you haven’t been to the Catalan capital yet then I strongly suggest that you go as soon as possible and here are the top 4 things to do when you’re there. The architecture of Barcelona was largely influenced by Antoni Gaudi, his masterpiece was the designing of Sagrada Familia, a stunning and intricately designed cathedral that is set for completion in 2021. In spite of its unfinished construction, the cathedral still looks amazing and is well worth visiting. The cathedral is designed in the Gothic style and is filled with small sculptures, artistic indentations and features 4 grand spires on the roof. The main street in Barcelona is la Rambla, a wide street that goes from the Old Town all the way down to the incredibly modern harbor. One of the best things to do in the city, especially when you first arrive, is to take a coffee or a beer on one of the street bars on la Rambla and watch the people go by. There is always something happening here and in the night the market and food stalls open and the street takes on a different atmosphere entirely. 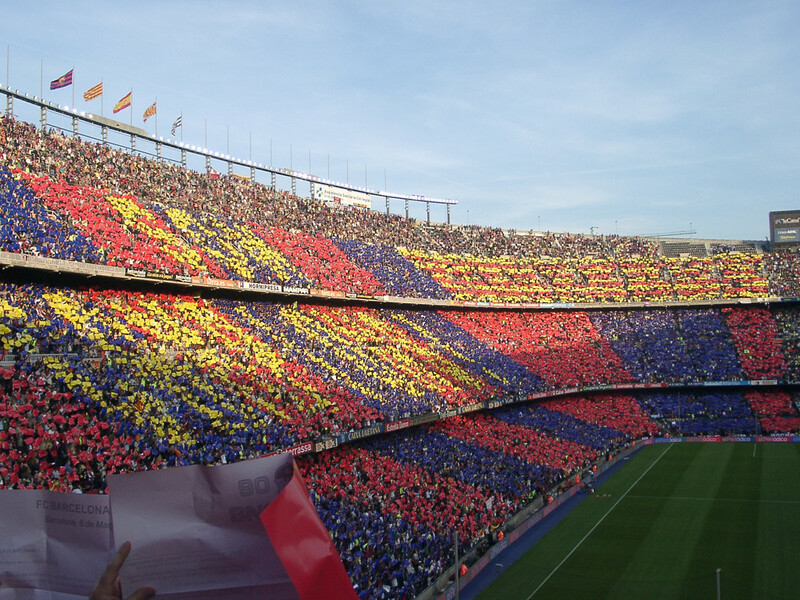 If you are able to get to the incredible home of Barcelona FC, the Nou Camp stadium during your time in Barcelona then I cannot recommend it enough. Even non-football fans will be amazed by the atmosphere here as 100,000 pick into the stadium to watch their beloved Barcelona. If you aren’t lucky enough to get there on a match day then football fans can take a tour of the stadium where they will go into the changing rooms and the dugouts before hitting the pitch and finally visiting the football museum, a celebration of all things football, and the perfect place for any fan to indulge in their beloved sport. Barcelona played a very important part in the life of artist Pablo Picasso, it is only right then that they possess would of the largest collections of the late artist’s work. To truly experience the greatness of Picasso you need to see the paintings and sculptures that are on offer in this museum. The museum was actually opened whilst Picasso was alive and he gave it a great deal of his work including sketches and drafts that cannot be seen at any other museum in the World. I am sure that you will fall in love with this beautiful city, I have been 5 or 6 times and even found myself searching for Barcelona villas for sale the other day, perhaps not to purchase right now but the idea of spending my summers in this awesome city is an idea that I intend to pursue.